Dean Corso (Johnny Depp) is a reptilian book dealer who cheats unwitting people out of antiquated volumes worth thousands with as much ease as lighting up one of his ever-handy cigarettes. There is no passion or sense of duty in his task, only reward and gain. That's what makes him an ideal candidate for the imposing collector Boris Balkan (Frank Langella), a grave eccentric who owns a library of ancient texts based solely around Satan. Balkan has recently acquired one of the most unholy of books, The Nine Gates of the Kingdom of Shadows, but he fears that his edition may be a forgery and employs Corso to investigate the only other two copies in existence to see if he can discover any discrepancies. Traveling to Europe, Corso finds himself slowly but surely being drawn into a sinister web of haunting strangers, dangerous sects, and a stalking shadow intent on killing anyone that gets in its way. But in a search to find an authentic text that was supposedly authored in collaboration with the Prince of Darkness, there are always worse eternities waiting. One can only imagine the sense of disappointment audiences might have felt after viewing The Ninth Gate in theaters. The marketing and trailers for the film (Link Here: http://www.youtube.com/watch?v=UaKkbgtlmZQ) certainly made the film up to be more akin to an apocalyptic blockbuster ala End of Days than the subdued thriller that it was meant to be. Rather than being a Van Damme, the movie is more of a Val Lewton, if you'll pardon the phrase. It is a film that takes its precious time, as its 133 minutes will surely attest, but this is to the benefit of the patient viewer. Each of the proceedings moves at the whispering pace of an overturned page, ticking away like a cinematic Lament Configuration that forces us into its twisting narrative. Our eyes go unblinking as Polanski's camera crawls with menace towards Corso and scans the scarred and sacred contents of Balkan's devilish collection. The silence is most overwhelming of all. Not only do we literally hear it in the hushed corridors of the library and the lush peace of the French countryside, but the film's acts of violence (save for a strangulation by pentacle) go unseen, unnoticed, as if we are shying away from their grisly sight. Corpses are discovered drowned in filthy fountains and, most macabre of all, garroted in mechanical wheelchairs that careen about rooms madly with their stiff cargo in tow. There's no need for bloody exorcisms or towering hell spawns in this film. If anything, the restraint makes the possibility of Evil incarnate lurking in the shadows only more plausible. If Satan were to be amongst us, he'd attack quickly and quietly, not unlike the fleeting shadows and visions that toy with Corso's perception as the story goes on. In the character of Corso, literature buffs find a familiar friend. His profession, dusty literary historian and plunderer, recalls the stuffy academics who found themselves being haunted by the ghastly imaginings of their creator, M. R. James. But whereas those blokes were prodded on by their overriding hunger for knowledge and the pursuit of all matters scholarly, Corso channels the hard-bitten cynicism of the two-bit gumshoe we'd see prowling the pages of a James M. Cain or Cornell Woolrich novel. 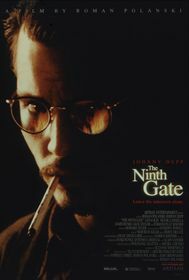 The Ninth Gate is surprisingly similar to a noir in its story and structure. For instance, the description "a jaded investigator is backed by a sinister benefactor to search for a mysterious artifact that is the object of everyone's greed" would service this film well, but it could also summarize John Huston's The Maltese Falcon. The Ninth Gate takes the mystery-fueled and intrigue-rich plot from a pulp detective yarn and perfumes it with a dark essence that makes its dangers far more horrible and damning in comparison. Whereas the crime noir variant of this tale would be grounded in the crowded streets and alleyways of a bustling metropolis (as The Ninth Gate is at its start), Polanski takes us on a journey across the Atlantic, giving us a scenic view of some rambling mansions in Portugal and, most impressively of all, the majesty of the French countryside. This transition of scenery is important, as it brings a whole new depth of mystery to the proceedings, one that might have been blared out by the honk of taxi cabs and the agonizing flash of neon lights. It is in the deceivingly peaceful calm (there's that silence again) that the story proceeds to blossom like a deadly flower. There are touches of "stranger in a strange land" surrealism (re: the Lewis Caroll-esque Spanish book dealer twins), but there's also a haunting beauty present in the landscape. One needn't look any further than the locale of the film's climax: a crumbling medieval castle backed by a golden sunset on the windy, forested mountains of the country. It's this seeming serenity, this façade of beauty (which, really, is just so Satan's thing) that lulls us into a short moment of tranquility before the fire and brimstone come out in all their pleasures-of-the-flesh glory. These scenes are augmented with a score composed by Wojciech Kilar, the man responsible for the intoxicating strings from Bram Stoker's Dracula (1992). Here his horns and winds take turns at being morbidly whimsical, sinister and, as is to be expected by Mr. Kilar, darkly operatic, which fits the nature of this Beast perfectly. While people might not consider The Ninth Gate Roman Polanski's magnum opus, it should certainly be applauded and appreciated for being a solid and shadowy horror film that was made in an age when the main genre output was anything but (rest easy now, Sixth Sense defenders). This is a film for the readers, for the bookworms and the page-turners and even the dog-earers. It invites us to bate our breath, to watch carefully, and to read between the lines. So if you're one who seeks a more sinister book club, then step on through the gate. You're in good company, friend. Submitted by Will E. (not verified) on Tue, 2012-04-03 10:52. "...more akin to an apocalyptic blockbuster a la End of Days than the subdued thriller that it was meant to be. Rather than being a Van Damme, the movie is more of a Val Lewton." Great point, and it explains why I avoided the film for a couple years but was very pleasantly surprised when I finally watched it on DVD. Definitely needs a rewatch. 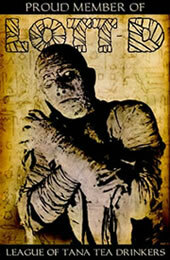 I recall reading the original novel, but found it less, well, fun than Polanski's version! Submitted by Scary True (not verified) on Tue, 2012-04-03 15:51. Always good to see The Ninth Gate get its due. I think it has to be the most underrated horror movie. I think it was made at the worng time, although I'm not sure if it has more in common with 1960s stuff like Rosemary's Baby or to today's movies like Ti West's The Innkeepers. Submitted by Veritas (not verified) on Sat, 2015-06-13 23:42. While the movie is worth a see, the ending makes one want to eat several volumes to get rid of the nasty after taste of a movie that has become aimless and pointless. Not for those who watch a real ending. Be warned.